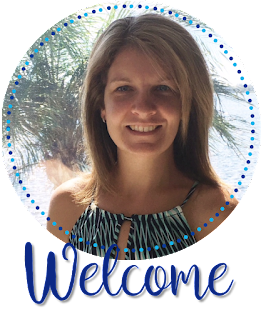 I'm so excited to be teaming up with some of my fellow Maestros de Español for a blog hop! We'll be sharing fall/winter tips and activities that you can use in your Spanish classes, doing some super awesome giveaways, and give info on a sale going on during our blog hop that you may want to check out! During the Blog Hop, many Spanish teachers will be highlighting 4 of their favorite products and listing them on sale in their Teachers Pay Teachers store. 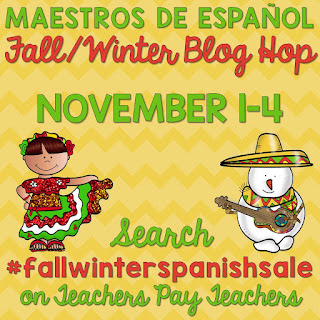 You can search #fallwinterspanishsale in the search bar on TpT to access all of the resources on sale. My featured products below will be discounted during the blog hop, November 1-4. First up, I want to share a couple of seasonal products. The week before Thanksgiving, in addition to our Thankful Turkey bulletin board, my students create Thanksgiving Flip Books. I have them add the books to their interactive notebooks, but they can certainly work as a stand alone activity. These are perfect for beginning Spanish students to use to talk about how they feel, what they do, where they go, etc. during the holiday break. Before the Christmas break, students often get restless and need a creative review activity. 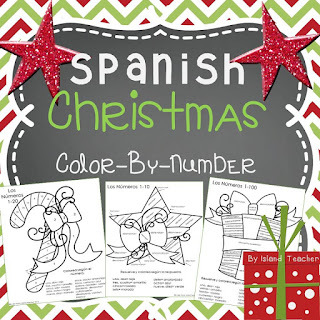 Here's a set of differentiated Spanish Christmas Color-By-Numbers. This works great as a fast finishers activity as well. Speaking of students getting restless, this time of year it's great to incorporate some games. 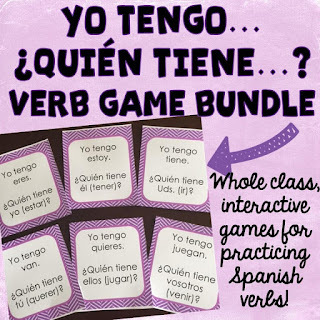 Use this bundle of "Yo tengo...¿Quién tiene...?" verb games which require the whole class to interact in conjugating verbs. 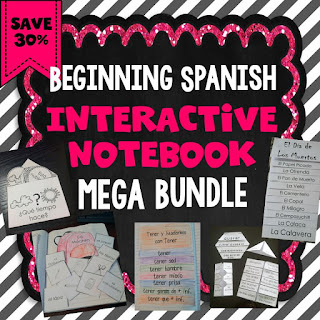 Finally, I've super excited to share about my best selling Beginning Spanish Interactive Notebook Mega Bundle. If you've read my blog before, you know that I'm a HUGE (understatement) fan of interactive notebooks! Using interactive notebooks in my Spanish classes has truly transformed the way I teach. You can read some blog posts about starting interactive notebooks HERE and HERE. 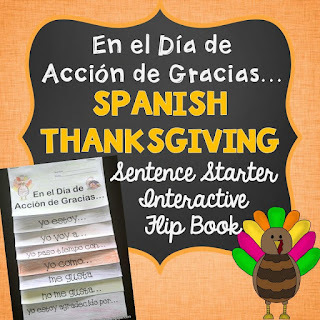 This collection of resources and activities will help you in starting or building your own Spanish interactive notebooks. It even includes the Thanksgiving Flip Book mentioned above. The bundle is already reduced 30% off of buying the activities individually and during the blog hop, November 1-4, you can snag it for an additional 20% off on top of that! I wish you the very best as you plan and prepare for the fall/winter seasons in your Spanish class! Now for the best part!!! Some of the bloggers will also be giving away gift cards from Teachers Pay Teachers, so that you can have some fun buying resources for your own class! Enter my giveaway and then don't forget to visit the other Spanish Teacher blogs which are linked below for more tips, activities, sale info, and a few more giveaways! Your flip books are such a great way to engage students and make learning fun! I love you Thanksgiving Interactive Flip book! I love your ideas! Thanks so much for sharing! Thanks so much! :) Have a great week! I really look forward to college football each fall. :) Thanks for sharing some great ideas! love, love, love Cuadernos Interactivos! You make the best stuff! Always quality work! I love everything about Fall - the smells, crisp air, wearing sweaters...it's my favorite season by far! I love going to apple orchards in the fall!